iPhone copied its smooth scrolling from Project Green? James Gosling has posted a video of Project Green - the one that gave birth to Java. Considering the technology was developed one and half decades back, its really amazing to see what the little hand held device can accomplish. Full touch screen, speakers (yeah, but ugly sound theme), infrared and yes smooth scrolling in the touch screen interface. Is this where iPhone copied it from? Watch the video and decide yourself. I think if Sun had patented it, it could have sued Apple! You have too many credit cards. One card gets you reward points for a dress purchase; other will give you cash back for swipes in restaurant, and so on. Too many cards, too many offers. Its best to carry all your cards while shopping. You wallet becomes heavy and if you loose it you are in a real mess. BEA's download site lists the officially supported OS. Mac won't be there in the list. If you select IBM AIX/ HP Itanium, you will see that the downloaded file is server<version>_generic.jar. These jars can be used to install Weblogic on any machine with a JRE. Run the <bea home>/wlserver_10.0/common/bin/config.sh to create your own domain and go to the domain directory and run startWeblogic.sh. Its all the usual stuff. Nothing specific to Mac. நேத்து போட்ட பதிவில இருந்த போட்டோவ பார்த்து கோயமுத்தூர்ல பொறந்து வளர்ந்த மக்களே கண்டுபுடிக்கமுடியல. பெங்களூரு ITPL, சென்னை Tidel எல்லாத்தையும் தூக்கி சாப்புடற மாதிரி இருக்கேன்னு நெனச்சு, எல்&டி கட்டின அப்பார்ட்மெண்ட்ல இருந்து ரேஸ் கோர்ஸ் வரைக்கும் மெயில் தட்டிவிட்டிருந்தாங்க. படத்துல அப்படியே மேல மேகோட்டு மூலைல நல்லா பாருங்க? பஸ்ஸுக எல்லாம் அப்படியே கீழ போகுதுங்களா? அது நஞ்சப்பா ரோடுங்க. மூலைல இருக்கறது காந்திபுரம் டவுன் பஸ்டாண்டுங்க. இப்ப தெரியுதுங்களா அது எந்த எடம்ன்னு? உள்ள போனா சும்மா தங்கறது மட்டுமில்லீங்க சிக்கனோட சாப்பாடும் எலவசமா கவர்மெண்ட்டே குடுப்பாங்க. சும்மா சொல்லக்கூடாதுங்க, ஏதோ ஹாலிடே ரிசார்ட் மாதிரி ஜம்முன்னு கட்டிவெச்சிருக்காங்க. எனக்கு என்னமோ ஒரு ரெண்டு வாரம் அங்க போய் தங்கிட்டு வரலாம்னு தோனுது. பிட்பாக்கெட் அடிக்கறது எப்படின்னு எங்காச்சும் கத்துக்குடுத்தா சொல்லுங்க. 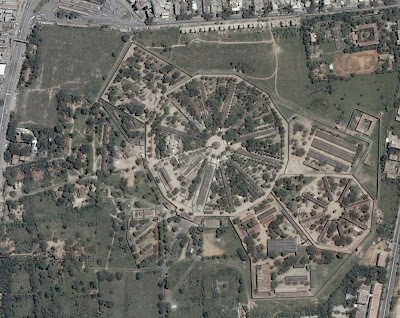 கொசுறு: அந்த போட்டோ நான் எடுக்கலைங்க, உபயம் - Google Earth. அட ஆமாங்க ஆமா. இப்போ high resolutionல நம்ம ஊரு நல்லா தெரியுது! Today my friend came to my house, who has recently bought a Motorola mobile with 2 Megapixel camera. 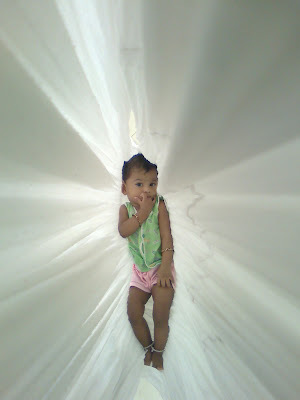 I thought of testing it and took a snap of my daughter in the cradle. The photo came so nice that I've to immediately send it to my Mac thru Bluetooth and blog it. Not bad for a camera in mobile phone na? When I decided to moved to Coimbatore, I was looking for a job here and posted my profile in job sites. OMG, Eclipse plugin development is hot in India. Esp. for few of those who knew it well. I got so many calls from many consultants but the jobs are based in Bangalore. I clearly said "either get me a company which has a development center in Coimbatore or at least a company which will allow me to work from Coimbatore". They are always confused of the second option. As Yadhvi said "It is better to knock on a closed door than to assume it will not open and walk past". I was knocking and a door opened. Its Fiorano. I explained my situation, they understood it. Most of my friends still don't digest the idea. The first question would be: "So you are a contractor now?" No dudes, I'm an employee but work from home. I know working from home has its own disadvantages. Forget missing all the "Sweets at my desk" mails, I'm mising my basic rights to have coffee whenever I want. Its restricted to a maximum of 5 coffees a day. I was prepared for everything. I stayed back in Bangalore for 2 weeks to interact with the team personally; at home, separate room for office work; two DSL connections; inverter backup (yet to purchase); ... But not everything goes as planned right. Disaster came on the day I left Bangalore and started work from here. My teammate resigned. So every week, I've got to fly to Bangalore on Mondays and fly back again on/before Wednesday. Staying in hotels; missing my daughter; waking up at 4 AM on Monday morning to catch a flight. Sigh. It ends this week. Hope I'll be really working from home after this. அப்பாவி ஆறுமுகம் : படிக்காதவங்க எழுதற blog எல்லாம் நீங்க பார்க்கறதே இல்லயா? This time its not a digital camera or Mac. But with my normal film camera. The first few are when we force her to have Cerelac and the last two are THE best photos I've ever taken. A new addition to my family. Very very happy. Purchased a house. Finally I made an investment. Good. Shifted my job again (sigh) Good that I didn't switch technology again. Still with Eclipse Plugin development. OK.
Got a MacBook Pro from office. Cool. I didn't reach one my life time goals of becoming a CEO before 30. Sad. Overall: A nice and wonderful year. 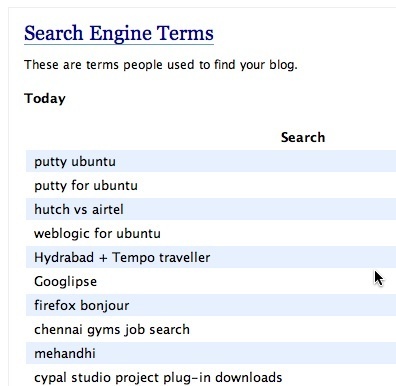 Who ever said that web search is a solved problem, please look at the search terms, for which Search engines referred this blog! If you don't want to download pirated MP3 files, the only option so far is to purchase an audio CD and rip it into MP3. I've been doing that way since I decided no pirated music. Simply, for Indians, there is no way to purchase music on the net. Sometime back HCL was talking about that (partnering with Apple for iTunes music store in India), but it didn't happen. 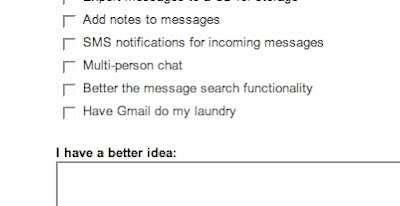 Now there is a nice option (or at least only now I noticed). Raaga.com has an option to legally download our beloved songs. The advantage of online purchase is you don't have to purchase the entire album, just because one song is nice. You can pay for and download individual the songs that you like (mostly @ Rs 12/- per song). This time, I sat with her and kept on pressing the Shoot button at 10 seconds intervals. That was a long list of photos and few selected photos here.